Audi looks very well prepared to cover all customer genres through its various models and trim levels in them. Giving an open top version to its TT Coupe, Audi recently released two versions, Audi TT Roadster 2015 and Audi TTS Roadster 2015, Latter being a powerful version in comparison to first. 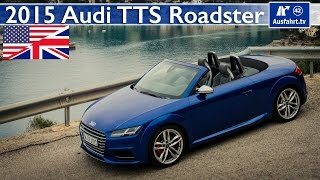 If you have been following us, we are sure you would have read about the former model as we are here to discuss about the more powerful latter version, Audi TTS Roadster 2015. Let us see its features and power it carries beneath its hood. 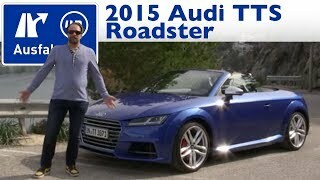 Interior of Audi TTS Roadster 2015 to a lot extent resembles to its less powerful sibling. Major difference in there can be notice on dashboard which gets technical laser texture, giving this model a sportier look. The floors inside the interior of Audi TTS Roadster has been made from hot-shaped steel, the same also follows its durability in the front section of interior. All new low mounted and with more pronounced bolsters sports seats come integrated with head restraints to provide utmost comfort. Another important feature in there is the Virtual Cockpit based on 12.3 inch LCD display which gives unmatched experience and graphics through Tegra 30 Graphics Processor from NVIDIA Tegra 3 series. The exterior of Audi TTS Roadster won’t let you take your eyes off its five-arm star design, 19” alloy wheels and highly efficient and attractive all weather LED headlights and taillights. 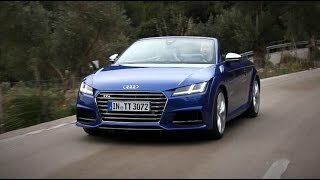 Audi TTS Roadster 2015 comes with electrically actuated fabric top which can be open or closed even at the speed of 31 mph taking the tickle till 10 seconds. Talking more in special features loaded, the model comes with and electrically extended spoiler. The same will get to its work as soon as you’ll reach the speed of 74 mph and the accelerator keeps on feeling the pressure making the meter rise high and high. Last but not the least here in the exterior of Audi TTS Roadster 2015 we would mention the flat and wide single frame grille and the four rings positioned below it give a remarkable appearance to the front fascia and thus leaving an unmatched impression over the spectators while you roll TTS Roadster down the lane. 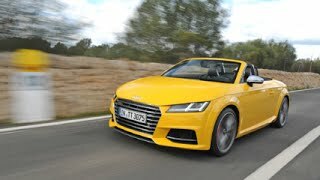 Audi TTS Roadster gets its power through a modified version of 2.0 Liter TFSI engine delivering 310 hp and 380 nm torque paired to Six-Speed S tronic automatic transmission. With these specifications Audi TTS Roadster is capable of reaching a top speed of 155 mph while the 0-62 mph sprint stands at just 4.9 seconds.